Nonnegative order of the Bessel polynomial. Bessel polynomial of order evaluated at x. The following equation shows a recurrence relation that defines the Bessel polynomial of order n.
When n = 0, P0(x) = 1. When n = 1, P1(x) = 1 + x. 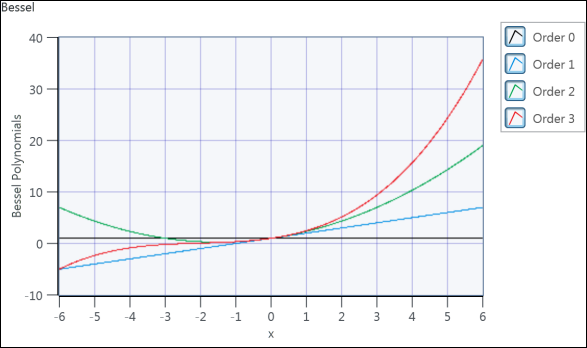 The following illustration shows the four Bessel polynomials of order n = 0, 1, 2, 3. The range of x is from [-6, 6].